Andy McMillan is President and Managing Director of BACnet International, where he works with users and suppliers to expand and enhance the BACnet community. Previously he served as president of a building automation and energy management business unit of Philips Lighting. Andy has been an invited speaker on BACnet and open systems at conferences around the world. He has been awarded a dozen patents, has co-authored a book on data communications and his background includes BSEE and MBA degrees. Industry research indicates BACnet has strong global market share and a secure future. Sinclair: Tell me about the research report. McMillan: The BACnet Adoption report was extracted from the “Market Penetration of Communications Protocols” market research report published by BSRIA. The BSRIA report provides data on the 2012-2017 market share of all major BAS communications protocols, including BACnet. 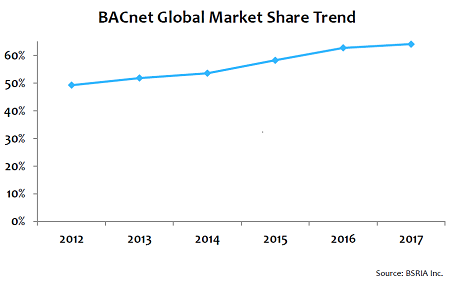 Along with reporting that BACnet’s share of the global market is 64%, it also projects continued growth in BACnet market share through 2022. Sinclair: Why is this BACnet study important? McMillan: Building owners and operators investing in building automation systems need to know the communications infrastructure they specify has broad industry support and a secure future. Prior to this report, they had to rely on anecdotal information or information from suppliers trying to sell them a specific solution. This report provides users with an independent source of data to inform their decisions. Suppliers also make long-term investments in the form of new products for building automation. They face the same questions about industry support and longevity of various protocols. This report provides them with the country and region-specific information on current and future adoption to guide their product investment decisions. Sinclair: What’s the future outlook for BACnet? McMillan: According to BSRIA’s five-year outlook, the adoption of BACnet will continue to grow due to ongoing improvements to the standard as well as its integration with IT technologies, including IPv6 and web services. Sinclair: What does the increased adoption of BACnet mean for customers? McMillan: Customers can specify BACnet for their building automation systems with confidence that the technology and supporting products will be around for the long term. The large market share of BACnet also ensures users will have a large selection of products and service providers over the life of their building systems. Sinclair: How does IoT (Internet of Things) affect the future of BACnet? McMillan: The technologies underlying IoT have the potential to significantly improve building automation and the operation of building systems. However, the consumer approach to IoT does not serve the needs of commercial building systems. Successful application of IoT to commercial building system will utilize BACnet infrastructure for data access and control systems. Recent articles and papers referring to this are using terms like B-IoT and BIoT and IoT for Buildings to differentiate commercial applications from the more widely touted consumer market. Sinclair: Where can we get a copy of this report? McMillan: The BACnet Global Adoption Study is available to members of BACnet International at no charge by contacting the BACnet International office. Sinclair: Where can I get the full BSRIA report covering all major protocols?.